If you have not heard about the HiperFire line of Single-Stage triggers, you should seriously consider them. They are absolutely awesome from the HiperTouch 24 to the enhanced HiperTouch 24E, to the full blown super-tuned 24C competition model—all in a game changing trigger design. Yeah, I know you have heard it all before, however this time it is different. The magic is delivered via spring cam-ed pressure on the hammer which counteracts much of the hammer spring force within the first couple of degrees of movement around the point of sear engagement. This delivers the perfect situation for a great feeling trigger and break. After the hammer begins to move forward the cam applies pressure the other way and greatly increases the hammer force. This increases hammer fall force, decreases lock time…etc. it’s a best of both worlds design and its a totally new trigger design. The HiperFire has three spring sets (light, medium-light, and medium). Initially, I though the heaviest strongest spring would deliver the heaviest trigger pull however it is the other way around. The strongest spring exerts more pressure on the cam and delivers the lightest trigger feel. This is what the dual spring and cam design of the HiperFire triggers does. It’s a mind screw when you first pull back the extra force hammer and have such a light trigger pull. The Hipertouch 24, 24E & 24C all shared many key features. All of the triggers are AR15/AR10 fire-control compatible with any lower receiver with industry standard .154″ receiver pins. The triggers are screwless “hard” tuned with static precision springs which inherently makes the trigger more reliable than a screw tuned design which can go out of “tune”. The user can tune the trigger at 2,3, and 4 pounds with the three supplied spring sets. 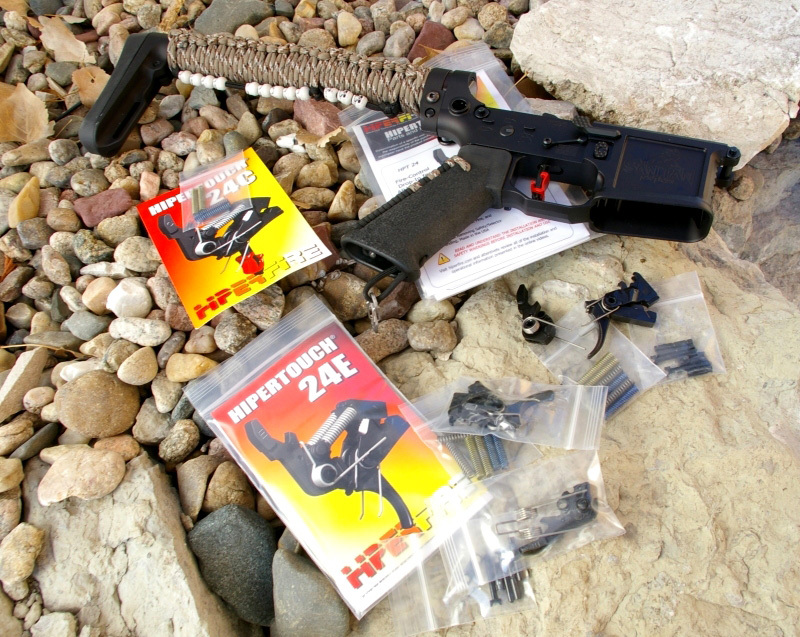 The focus of the base HiperTouch 24 is to deliver a high performance “no modification” drop-in trigger upgrade for service/defense/duty rifles. For safety in high stress environments, the 24 delivers a flat but short and smooth per-travel with a fast reset. By comparison, the pre-travel for this model is just a tad bit longer than the cassette design CMC and Timney triggers, but the 24’s pre-travel is shorter than what you would find on a Geissele 2-stage trigger. The HiperTouch 24 is on a pretty even feel with the CMC from a feel and intent, however the CMC has less take-up but the HiperTouch has a better break. In this case I would say the HiperTouch would best suited to those builds that demand accuracy and a margin of safety. For a defensive rifle, this would be the trigger I would choose in the lineup. The 24Elite haves the initial pre-travel, delivers a faster reset, and the post reset pre travel is also shortened. In essence the 24E is tuned to be about twice as sensitive as the base 24 model for the needs of the competitive shooter, hunter and precision LE/Military sniper. 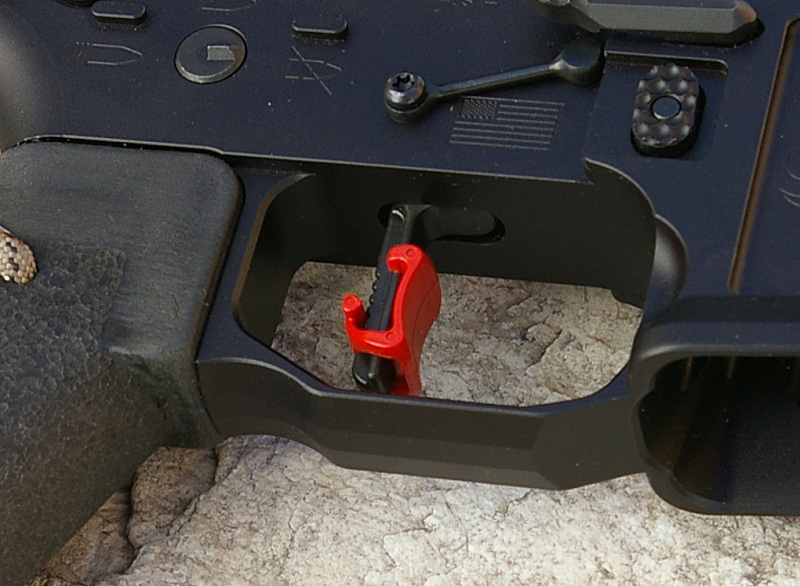 I would not put this trigger in a general purpose defense AR15, however if you had an defense rifle which you also use for competition and precision long-range shooting, this wild be a great go to option. This trigger is similar to the very light AR-Gold and Timney triggers, but can achieve an even lighter trigger feel with very crisp trigger feel. The 24E has just enough pre-travel to deliver a very safe trigger, but can still deliver a match quality trigger feel. 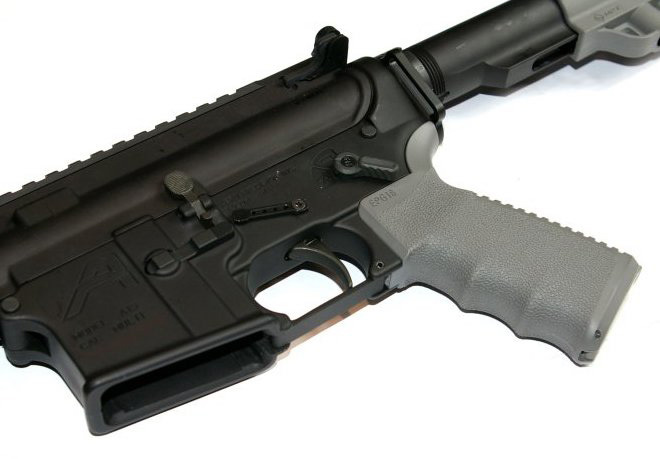 The flat trigger design has become a favorite of mine in all sorts of formats from 10/22 rim fire rifles to this Ar15 design. With the 24C, the tunable trigger shoe offers another advantage for both finger placement comfort and fine tuning of trigger weight. I mounted this in my SanTan Tactical lower receiver and clipped on a 5.45×39 upper which shoots extra hard Russian Surplus rounds.Generally, I will have 1 in 200 that will fail to detonate, however the 24C greatly reduced that soft strike failure rate to only about 1 in 500. This shows that even the top end of the HiperTouch line can still bring it for both a stunning trigger feel and best in class hammer fall force. You will see these triggers quite a bit in builds going forward simply because I believe HiperTouch has delivered on a truly innovative design that actually works both theoretically and in practical use. The price ranges are extremely competitive to other high quality triggers in the market as well… The 24 is a screaming great deal with no tunable trigger in the $185 MSRP price range. 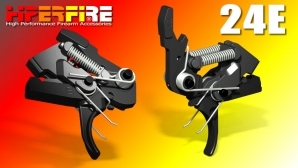 The HiperFire HiperTouch is an outstanding line of triggers which is turning heads in the industry and changing minds about what a great trigger can be…. Even if you are not a budding rap star. Have you tried a HiperFire HiperTouch trigger? How did it compare to other aftermarket competition triggers? Share your answer in the comment section.